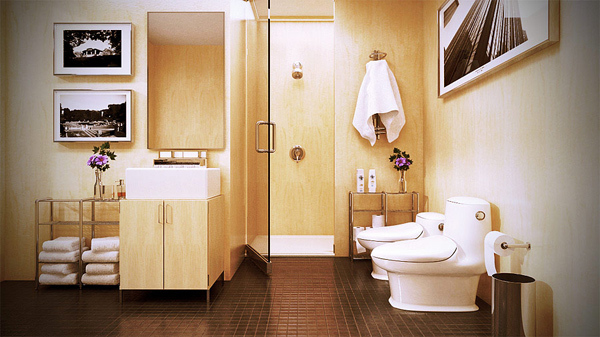 The bathroom is one of the most crucial areas of the house. It is where you can refresh yourself before or after work. It is one of the most vital areas of the house where one should maintain the cleanliness. This is of course to keep the comfort and relaxing mood for the people who will use it especially the members of the family. 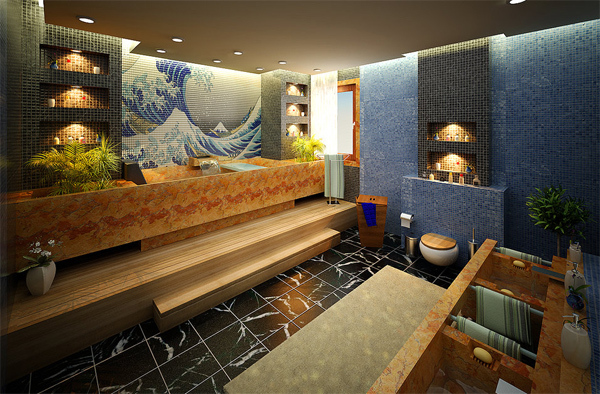 Well there are different kinds of designs and styles of bathrooms nowadays. With that there are various accessories, furniture and fixtures that are set in the bathrooms to make it more appealing. Well, of course the designs of every bathroom are varied much on the client’s choice or maybe the concept of their dream house. 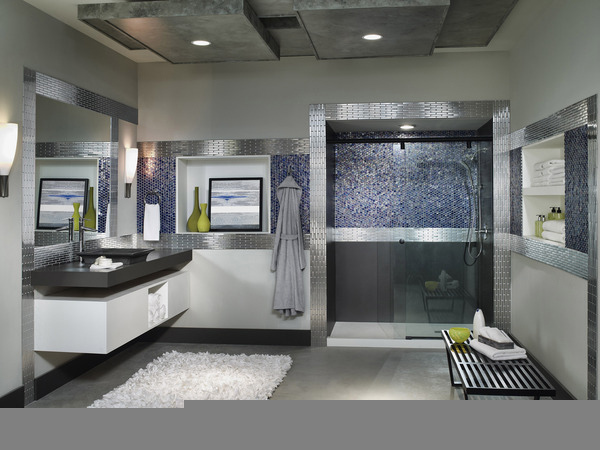 Since some of the house of today is contemporary, we are going to present you different contemporary bathroom designs. 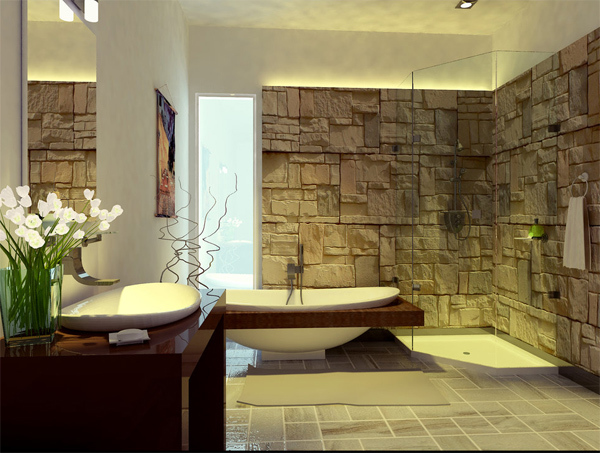 So, let us check the contemporary bathroom designs below. 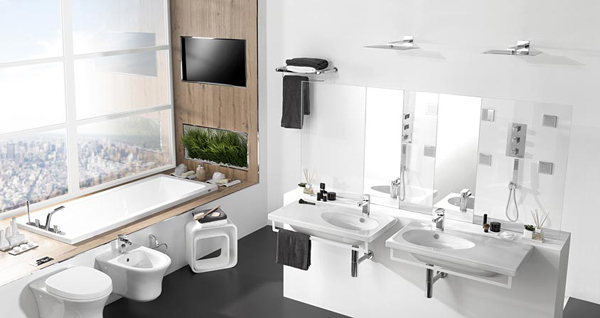 You will surely feel comfortable in this spacious bathroom with its unique accessories inside. What a truly relaxing bathroom it is because it has a shade of white and black that makes it more luxurious and alluring. 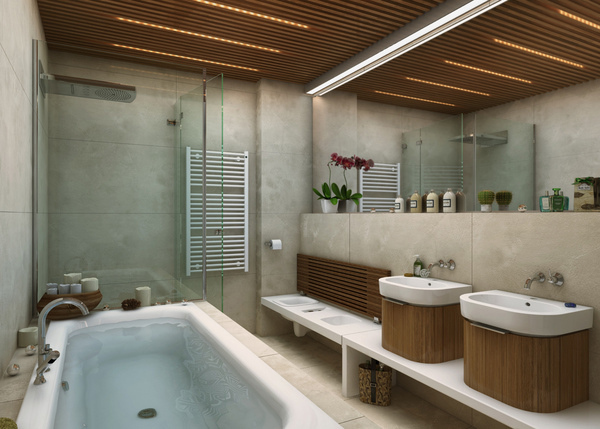 The vivid lights and amazing shape of the bath tub makes this bathroom more elegant. 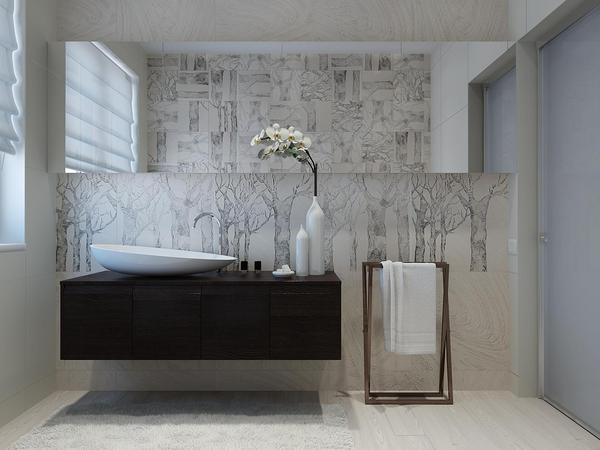 The furniture and fixtures utilized here complements with the white and gray palette in this zen bathroom. You may observe the stone wall combined with the glazed walls that add to the totality of the remarkable style of this Master bathroom. 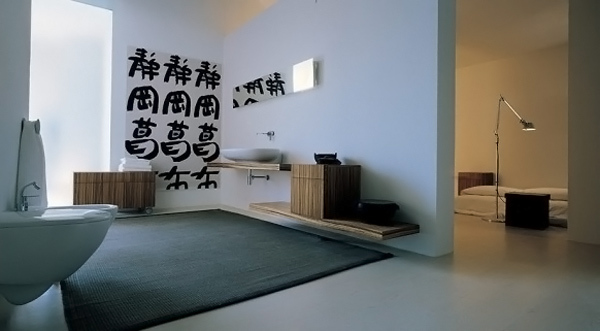 You may distinguish the neatness and cleanliness of this simple bathroom that matches the art frames hanged on the wall. The design and style of this bathroom is really suited for a luxury hotel as you can see the incredible fixtures and accessories here. With its glassed walls, this great work is capable of providing a connection to the beauty of the exterior. 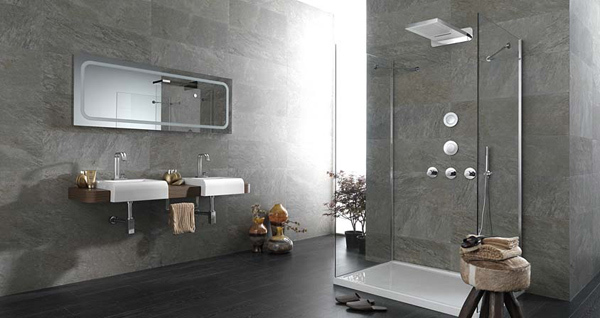 Displayed here is an innovative and well-design tiles that work well with the accessories and fixtures used. What you are looking at right now is a Japanese mosaic in a Japanese bathroom. The usual utilization of the wooden materials and plants are still present here. This is quite a simple bathroom but you will see the cleanliness and neatness emphasized here with a touch of gray palette in the walls and floorings. The amazing stones and pebbles included together with the wooden laminated counter top and bath tub platform make this bathroom more cozy and comfortable place to relax. 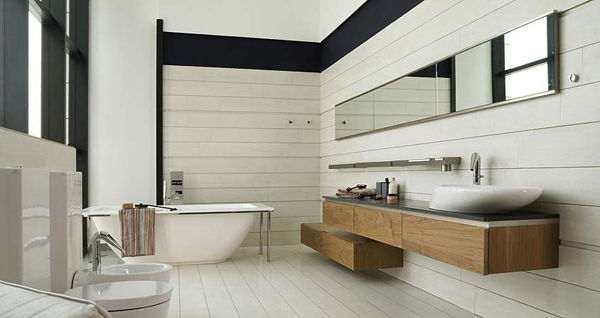 This is one of the modern contemporary look of a bathroom that you may say it’s simple but it is still attractive and provides a warm feeling to the home owner. White and wooden palette is somehow a perfect color combination that provides a stress-free effect to the owners. 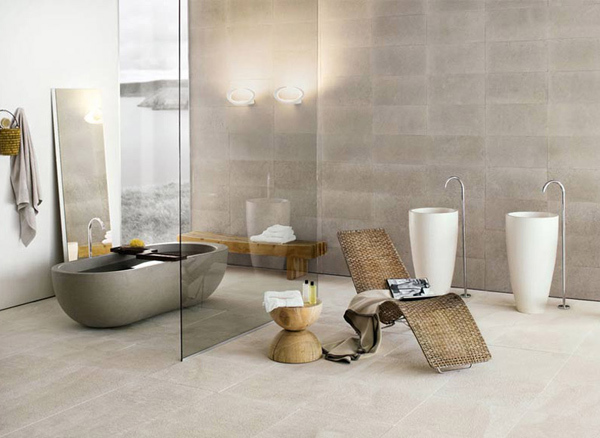 The texture and lines from the floors to the walls and ceilings are noticeably seen in this bathroom. Who will say that this bathroom is not cozy? The spacious and elegant bathroom is also a place where you can spend time reading your favourite novel while taking a hot bath. The dim color of the lights and the materials used here are extremely classy and beautiful. 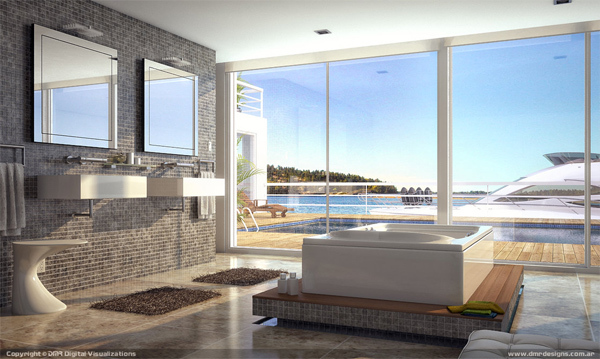 The sun’s rays can surely access this white and clean bathroom because of its walls made of glass. 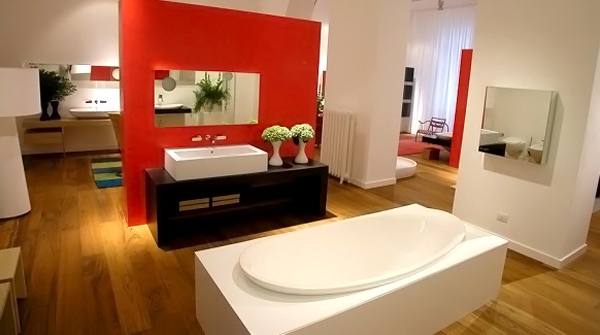 The red palette of one of the walls break the plain white color that is surrounding this bathroom. 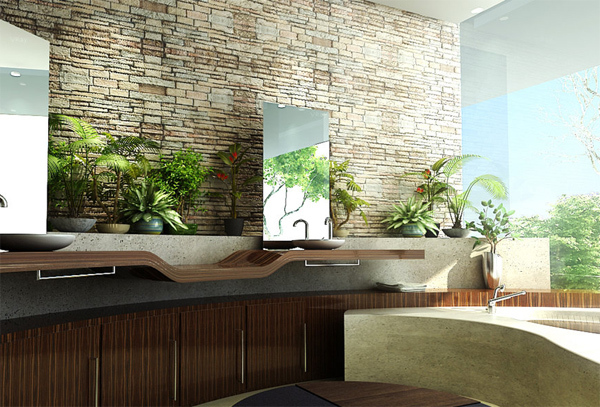 Thus, the contemporary bathrooms that we have seen will surely inspire you. Besides for sure it will not just inspire you but also give you more ideas that will fit the concept of your dream house. 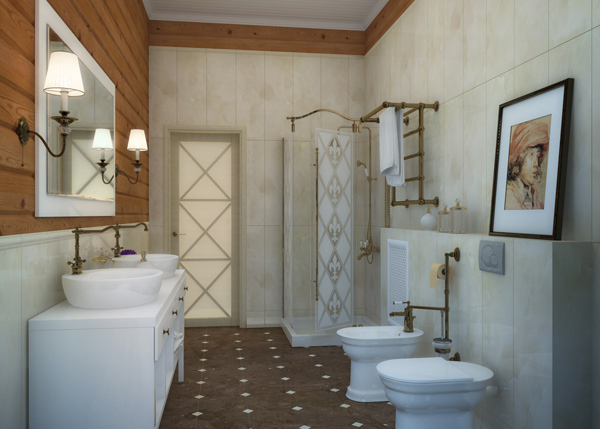 And aside from the fantastic creative designs, you may also take the full advantage of the efficiency of these bathrooms. 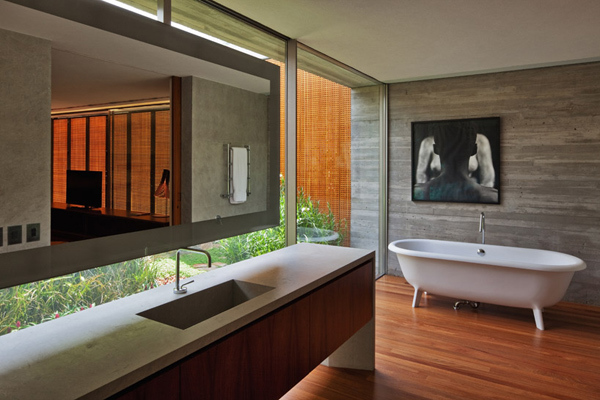 Yet these collections of contemporary bathrooms are undeniably simple but the most impressive latest bathroom designs. So, now you may also search for other fabulous bathroom designs in your place that will give you enough details that could be your guide for future use. Your choice must be unique and comfortable bathroom design that is pleasing to anyone’s eyes, right? If you like this article, you might be interested in some of our other articles.The successful mix of 1920s design and modern furnishings has its very own flair. Great photos, I’m actually searching for great furniture to create a more innovative bath in my house. I’ve seen that ROCA has great products, did you know them? Floriza Nice post …all pics are nice and i love this…all pic have some uniqueness ..